Patient Testimonials Irvine Dr Shepard Orthopaedic Specialist Orange. My arm feels great, feels strong. Don’t think about the surgery when I'm out there pitching, that's the key. All feels back to normal. Really appreciate the job of Dr. Shepard. His track record speaks for itself. "Knew Nee" Post-Op Recovery - Muchas Gracias & Many Thanks To -myorthodoc- @stevemoramd & Doc Mike S. & Staff For My Open Knee Surgery. 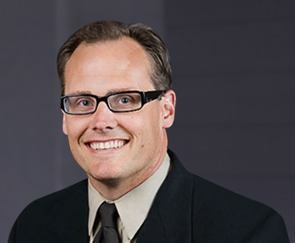 I have had the pleasure of assisting Dr. Shepard with the care of his patients since I opened my practice in 2004. Over the years I have come to realize how truly exceptional he is with the care of his patients. 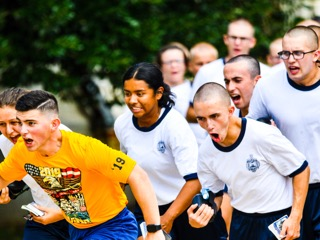 On June 28th we dropped our daughter off at Annapolis for the grueling six weeks of Plebe Summer and I worried everyday that we would get a call saying she was injured. The summer was tough, but she did it! She participated in all physical activities, including endurance courses, rock climbing walls and jumped off the 10 meter platform. We wanted to let you know that Kevin was named Player of the Year and also received HS All-American and 1st Team All-County Honors. We are so thankful for your care of Kevin’s shoulder last fall and setting him up for success this Spring. I just wanted to thank you for taking the time to answer all of my dad and I’s questions and giving me the options helping me to decide what to do. I know you are very busy and have lots of patients and things to do and places to be; so I really appreciate you taking the time to help me. I know a meniscus tear surgery is not a big surgery for you, but it has been a big deal to me. I just wanted to thank you for seeing that and fixing me up so that I can start playing again soon! Thank you !!! It’s time for Christmas wishes and an update on Ashley’s knee. Happily, there is no knee update, what knee ?!! Ashley just finished the cross country season as the number one ranked sophomore in California and number six overall in the state with a 3 mile PR of 16:53. She also did track and field last year and ran the 800M, 4x800, 4x1600, DMR, and 1600M – she broke the 5 minute mark making her #4 in the state and the only freshmen in the top 15 for state. She went all the way to CIF Masters which made for a very long season, but her knee never quit. I’m sending you her amazing statistics because that's how people measure success, but the real success is that she LOVES running and can pursue it without pain or fear of re-injury. We will be forever grateful!!!! Thought I would give you a quick recap of Sean’s first division 1 baseball game against University of Oregon. Apparently Sean is one of the closers for LMU he came in the 8th for one inning first batter he struck out looking, second batter he hit on the shoulder with a curveball that didn’t break, but he picked him off stealing second. The third batter he struck out. His arm feels great, it’s been a long journey for Sean, I wanted to say thanks for everything! Good morning Dr Shepard. This is Lisa, my son was your patient last year. Just wanted to send you this to give you an update on how great he is doing. We are grateful for all your help !!!!! He is doing great and still doing all of his rehab exercises. Currently, he is the starting varsity catcher at his high school and has several D1 schools looking at him right now. Without your help he would not have been able to see his dream coming true. We are forever grateful to you :). A healthy happy teenager is a good thing !!!!! Hope all is well your way. I wanted to take a minute to share my experience regarding you and your staff. From the minute you walked in and said “Hi, I’m Mike” the attention you and your staff afforded me was top notch. Thank you so much for not only all you have done to fix my knee but also for letting me shadow you! I really enjoyed the experience the I got following you around and learning what a day in the life of an orthopaedic surgeon is all about. I am amazed that you can see so many patients and have such a personal connection with ALL of them. Thank you for all your thoughtfulness. Please don’t forget about me while I’m gone on my medical mission trip as I plan to work in the office more when I get back in April! I want to say thank you for the excellent care I received from your whole team. The surgery and recovery could not have been better. I am normally not a fan of physician assistants but the way your whole team works together really provides outstanding care is fantastic. Seeing your Pas, Juli and Lorrie in clinic in conjunction with you was great. They made everything run smooth. I really had a great experience from the office to the surgery center at Main Street and back to the office. Yes, we're pretty darn happy with how things went. Thank you for everything!!!!! Our daughter earned her water polo scholarship one year after surgery. So, amazingly grateful for the wonderful gifted surgeon that made it happen! I tore my right arm rotator cuff in multiple places due to an accidental fall. Dr. Shepard performed arthroscopic surgery to repair my rotator cuff. After surgery and several months of physical therapy, I now have full range of motion on my right arm. In fact, you can't really tell which arm had the surgery, except for the small scars in the shoulder area. Less than six months post surgery, I was in rigorous training for my 200 mile bicycle ride from Seattle to Portland. 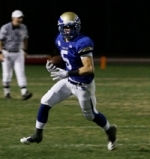 I tore my ACL shortly before my Junior season at Santa Margarita H.S. I did not know if I would ever be able to play again and visited three doctors to discuss my injury and what I would need to do to get back on the field. 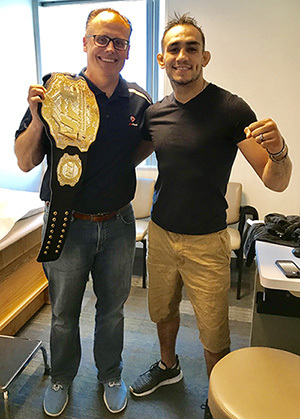 I met with Dr. Shepard last and knew immediately he was the person I wanted to do my surgery and guide me back to my sport. After the injury I was very disappointed and worried, but after meeting with Dr. Shepard I felt like I had a plan and would be able to return to my sport without any restrictions. He spent a lot of time with me explaining my surgical options and learning about me as a person. The surgery went well and from that point I was on to rehab. 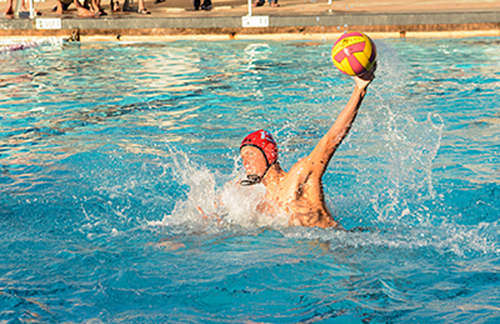 My son is a high school and club water polo player and swimmer. It is natural that he suffer some wear and tear injuries over the course of very grueling workout schedule. Early in his last swim season, he began to suffer pain in his shoulder. We visited Dr. Shepard who was able to accurately diagnose the problem. He instructed my son to combine rest with a series of very specific exercises designed to maximize and expedite his recovery since he was in season. After following Dr. Shepard's instructions to the letter, my son went on to set two league records and two school records for swim and while he missed one third of the season, he was named swimmer of the year on a league champion team. None of which would have been possible without the care and treatment of Dr. Michael Shepard. Thank you Dr. Shepard. My son still uses your exercises to this day as a method of strengthening and preventing injury. I wanted to check in with you and let you know how happy I am with my surgery! We are coming up on the 3 year anniversary in a couple of months. Last time we spoke was the first anniversary. Since then, I have been skiing every winter, including moguls and off mountain stuff. I have been playing soccer again for almost 2 years, although I never got back some of my speed/spring - being 34 now might also have a little to do with it. The knee has held up fantastically! Infact, I played in a tournament last weekend and took a pretty nasty hit to that leg. You can see the photo below. I just wanted to thank you for helping my daughter, Shea, with her knee surgery and recovery. She played in a tournament this past weekend at the University of Colorado – Boulder, and I wanted to share with you a comment that she made after playing lacrosse for a day and a half. It's been a year since my injury, 10 mos since surgery. Feeling great! Hiked in Mt Evans Wilderness (Colorado) last week. 8 miles RT, 2200' elevation gain to 11,800'. When our daughter Olivia tore her ACL while playing soccer at the age of 11 it was a devastating moment for our entire family. We researched the best options and kept coming back to the procedure and technique that Dr. Shepard has performed and recommends. The results were amazing and we once again have a happy athletic daughter on our hands. Olivia has experienced no knee pain since her surgery last September and within three months of being cleared to swim competitively, she qualified for five (5) Junior Olympic individual events. Dr. Shepard's knowledge and personlized approach are second to none. His approach is the best alternative for prepubescent ACL injuries and he is very gifted when it comes to working with kids! I felt lucky that everyone was taking such good care of me. They really listened and constantly went our of their way to help me."